September and October 2018 have been turbulent months for the market. Dow Jones industrial average and S&P 500 have now entered a negative territory. Nasdaq also dropped 4.4% amid growing concerns of weak profits and the potential negative consequences brought about by the US-China trade war. To add to this, investors became even more worried with the weakened US home sales report. A figure that is seen by many as a precursor of the health of the economy. With the slowing of China´s economy, many investors are now concerned that companies will report an even weakened profit brought about by increased costs due to tariffs and labor shortages. To make matters worse, there are suspicious packages being sent to public figures in the lead up to the US elections. All these plus fears of brexit uncertainty, and Italy´s submission of its populist budget have lead to a market sell-of in the US, Asia, and Europé. Some argue that this sell-off is emotionally charged but whatever the cause, one thing is certain – there is rising investor anxiety. On an operational level, the stock market does not affect businesses in the sense that regardless of how the market fares, a business will continue its business as usual. It will not decrease its planned sales depending on whether or not the stock market goes up or down. However, when talking about it on a strategic level, businesses can be significantly affected by this. A high stock price will make certain companies richer affording them an opportunity to buy other businesses with their own stocks as payment. A high stock price subsequently then makes the total price of the company increase which makes it harder for its competitors to purchase it. The stronger its stocks are, the more power it holds. 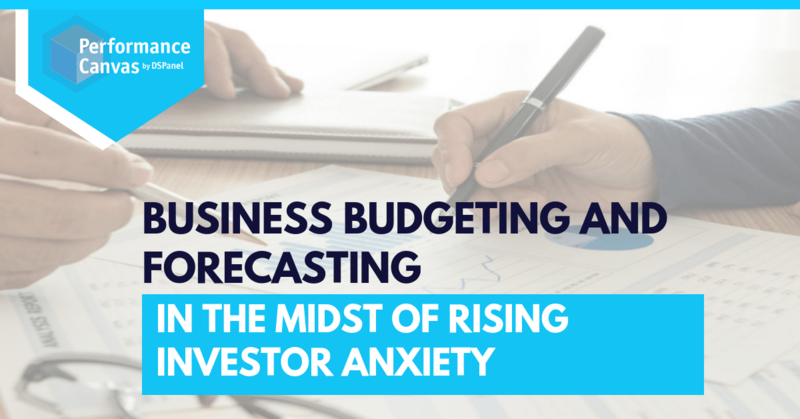 Businesses whether big or small perform budgeting and forecasting for a variety of reasons. One of it is to try and control the operational costs and increase profit margins. Because business leaders have to make decisions everyday in order to steer the company more effectively, it needs guidance. Budgeting and forecasting is one of those corporate activities that are meant to guide these decision makers in their strategy formulation. At a time like this when there is so much volatility in the market, having flexible budgets that allow businesses to react strategically ensures that the business can manage through difficult times. A business having decently accurate forecasts also ensures that it can more or less predict and spot emerging threats in the horizon. For example, in the event the economy continues to get weaker and a recession is just lurking around the corner, a business that is able to plan ahead for tougher times have a higher likelihood of making it through. That being said, there are businesses who want to make modern decisions using archaic methods such as spreadsheets. This is a real issue. Excel spreadsheets is not a budgeting and forecasting tool that can handle high data volumes or cross-functional processes among other things. In order to truly have budgets and forecasts that can deliver value to the business, you need a robust budgeting and forecasting tool like Performance Canvas Financials. Performance Canvas Financials is a cloud-based FP&A solution that is designed to be installed and setup in just 5 minutes. Its technology is meant to effectively handle cross functional teams and processes, complex business types, high volumes of data, and to even tie disparate systems together. Performance Canvas Financials ensures that you not only have clean and timely produced data, you also get the necessary insights from these data. Its goal is to truly connect data, people, plans, and process together so that the organization can operate more effectively. If you want to see how this cloud FP&A effectively executes budgeting and forecasting, see a free demo of the tool or request for a 30-day free trial by visiting www.performancecanvas.com or by emailing info@dspanel.com.